Though a lot of the top individuals in the championship field are not running this weekend, we'll still see a fast pace up front and a big battle against two of the strongest teams in the Southeast. Starrs Mill (GA) brings in some elite talent in Nick Nyman who ran 14:54 last fall winning the GHSA 5A State XC Championship. Nyman was 18th last year at Foot Locker South running 15:29 on this McAlpine course. It won't just be Nyman up front for Starrs Mill as teammate Harrison Fultz returns with a PR of 15:46 and was the 5A boys 800m & 1600m State Champion last fall. Weddington will be without top runner Kyle Durham, but will run the rest of their top 7 lead by seniors Will Mazur, Jackson O'Hara and Stephen Larson up front. The three hold PRs of 16:02, 16:07 and 16:18. They'll also have junior Jake Toomey as all four will likely be in the top 10 of this field. Rising sophomore Murphy Smith proved to be a force last year running 16:12 as a freshman. We'll see if Smith can continue that success and make a big jump this fall. 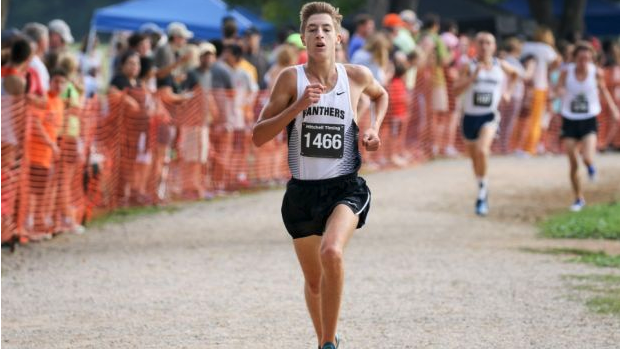 Pace Clark (Providence), Daniel Hopkins (Lincolnton) and Alan Deogracias (Blythewood, SC) will also be athletes to watch in this field all returning with PRs under 16:21. Cooper Castellaw (Alexander Central) and Jason Thomson (North Lincoln) are two athletes I expect will have a big breakthrough this fall. This will be the first big test for both boys this season. Thomson is coming off a track season where he ran 4:21 for the full Mile and 1:57 for the 800m. He should be able to make a big improvement off his 16:33 PR over the course of his junior season. The team battle is going to come down to Starrs Mill (GA) and Weddington. Our virtual meet scores it as 52 to 57 in favor of Starrs Mill. Weddington's key to success will be having a strong 5th runner, and I think they certainly have answers. Rising freshman Nate Jaster ran 9:14 for the 3K as an 8th grader finishing at the USATF National Runner-Up for 13-14 boys. He'll run his 5K debut tomorrow. Sophomores Joseph Lowther, Chase Barajas and Krystopher Durham will be looked at to step up for the Warriors this weekend. Ardrey Kell and Leesville Road boys will be missing a few of their top 7 runners this weekend, but look to be in a battle for 3rd. These are two programs I'm really excited to watch this fall as both have a ton of talent and potential. One year ago at this meet Carmen Alder (Pinecrest) went wild showing the state she was immediately going to be a force to be reckoned with. Alder ran 18:33 and went on to run 18:04 last fall. It's very likely she'll challenge sub-18 this season, and it'd be truly insane if she did so on opening weekend. It won't be an easy ride, as fellow sophomore Katie Pou (Nation Ford, SC) returns to a course she's had a lot of success at. Pou was a South Carolina XC State Champion as a freshman and returns with a PR of 18:05 from a year ago. Pou went undefeated until Foot Locker South last year, and this battle with Alder will certainly put her to the test. Ainsley Cooper (Reagan), Kelsey Vogel (Green Hope) and Darby Olive (Starrs Mill, GA) are names you can expect to see up front. Cooper is coming off a strong track season where she ran 5:04 and 11:04. He cross country PR of 19:15 from her sophomore year will likely be shattered this season. Injury held her out of most of the 2017 track season, but she'll be back as one of the states top girls this fall. Vogel was 7th in the field last year and returns with an 18:19 PR. She missed most of the 2018 track season as she works her way back into top form. Alexis McDonnell and Darby Olive return with PRs of 18:43 and 18:49 as they should also be girls to watch in this field. Weddington are holding out their top 5 girls leaving Green Hope, Starrs Mill (GA) and Reagan as the teams to watch this weekend. We'll get our first look at a strong Green Hope team who have 3 girls in the top 10 of our virtual meet. It's early in the year and we don't usually see the Falcon's run an all-out effort here. Reagan girls look to be strong through their 4th runner, but will seek for a breakthrough from a 5th girl this weekend. Starrs Mill comes in with a 19:30 1-5 average and will likely be the best bet to take down the Green Hope girls this weekend. Leesville Road come in 6th in our virtual meet team scores, but I'd expect them to be able to push for a top 3 finish this weekend as the Pride return a top of depth. Sam Gilman won the Championship section a year ago in 15:45, but will run in the Invitational section this year. Gilman enters after another strong year on the track running 9:09 for the 3200m and winning the SCHSL 4A 1600m crown last spring. Gilman should truly be the class of the field as he gets to take a good look at the Foot Locker South course. Behind Gilman will be John Ciprich from Piedmont who returns with a PR of 16:06. Ciproch had a great junior year on the track running 9:32 for 5th in the 3200m at the 3A State Championship. He was also 11th at the state meet in cross country last fall. 1A 3200m state champion Jake Baugher will also fight up front returning with a 16:16 PR. Baugher took 4th at the 1A State Championship in cross country a year ago and will look to be under 16 minutes this fall. One of his 1A rivals in Drew Zink will also square off with him. Zink finished 3rd as a sophomore in the outdoor 3200m last year and will be a contender for the cross country title this fall. Sanderson sophomore Carson Helmer will also compete up front after an impressive freshman year where he clocked a 16:27. Hilton Head should be the class of the field as a team despite having a big graduation hit. Marvin Ridge returns a strong pack with a 16-second gap and will look to challenge them as they open the season up. The main battle to watch will be Bishop McGuinness and Lincoln Charter. These are the two 1A team favorites heading into the season. Bishop has a tight 1-4 pack, but will be looking for a 5th man to step up. Lincoln Charter has Zink as a low stick up front followed by a tight pack from 2-5. They'll need that pack to improve this year if they'll want to take down Bishop McGuinness in November. Hilton Head's talent looks to be too much for the rest of the field as they return three girls that ran under 19 minutes a year ago. Isabel Muehleman, Tori Herman and Sarah Cooke will be three of the contenders up front as they'll look for a 1-2-3 finish tomorrow. They return with PRs of 18:44, 18:51 and 18:54 respectively. It won't be too easy for them as they'll face off with a strong 1-2 punch from North Lincoln in Alyssa Galvin and Angie Allen who ran 19:11 and 19:15 a year ago. The two will be contenders for the 2A Individual title after coming off strong track seasons. Indian Land's Hannah Sawyer and Abby Farris from Lake Norman Charter will also be in the mix up front returning with 19:27 and 19:32 PRs. 15 total girls enter the race with sub 20 credentials, so the field is going to be extremely competitive amongst the top 10-15 tomorrow depending on what form everyone is in. Hilton Head will come in as the favorites with their firepower up front, but don't have a solid 5th girl to compete with their top 4. Marvin Ridge has a solid pack with a 51-second 1-5 spread and will look to challenge Hilton Head for the team title. A battle to watch is one you'll see often this year between North Lincoln and Lake Norman Charter. The two teams should contend for a NCHSAA 2A podium finish this fall despite both teams losing their star runners this summer.